The St. Louis Blues seem to have all the right pieces falling into place at the exact right time this season, unlike at this point last year. Their goaltending has been stellar as of late (and really all season), with Brian Elliott becoming the franchise’s all-time shutout leader (21; 2. Halak, 20) and Jake Allen earning his 4th goose egg of the year this week, which paces all rookie netminders. Their offense is getting back into the swing of things with 5 players all at or above the 50 point plateau (Tarasenko-68, Steen-59, Schwartz-53, Backes-51, Oshie-50), and the resurgence of the ‘STL’ and ‘SOB (BOS)’ lines’ dominance being complemented by a crafty “3rd line” combo of Stastny, Jaskin, and Berglund that seem to be the exact scoring touch the team needs to be truly lethal. The team’s defensive core has tightened up with new comers Zbynek Michalek and Robert Bortuzzo adding more shot blocking, stay-at-home play, and a physical presence that was lacking for much of the year which makes these Blues’ seem primed to make that true Stanley Cup run in just a month’s time. 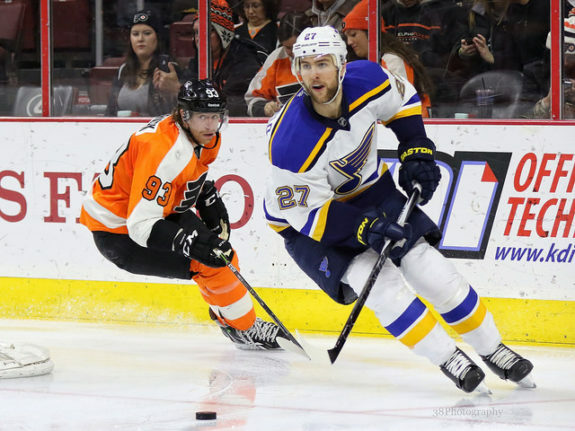 Even defensive standout Alex Pietrangelo has returned to his peak form to help lead the team down the right path, battling hard night in and night out to earn each crucial point in the standings throughout this March. They do still have one looming problem however, and that’s being able to find the consistent power play the team has had for the better part of this season. If this is indeed the biggest problem the team faces heading into Round 1 of the tough Western Conference playoffs however, then the Blues really are sitting pretty. It’s no secret that the more special teams success a team can duplicate in the postseason, the better their chances of moving on become. However, it is very difficult to be that consistent driving force while on the power play in the tight playoff race of today’s NHL. In fact, 3 of the past 4 Stanley Cup winners have averaged below a 13% conversion rate while up a man (CHI: 11.4%, LAK: 12.8%, and BOS: 11.4%), with the exception of last year’s Kings squad that was an impressive 23.5% on the power play throughout their championship run. That shows how important a good power play percentage is to a Championship team, and why the Blues need to hone their skills to regain their composure while up a man before entering into April’s do-or-die tournament bracket. In 2015, the St. Louis Blues have seen their consistency while up a man fade, going from a 26.3% conversion rate in January, to a measly 13.8% in February (they have raised the percentage to 19% through March so far). If they can manage to keep active feet and quick passing they will continue to raise this rate moving into the playoffs and could potentially put themselves in an excellent position to make the true Stanley Cup run that many expect from the group this season. Alex Pietrangelo has returned to his top form in 2015 (Amy Irvin / The Hockey Writers). As of late, the Blues power play has seen more downs than ups, and needs to begin clicking in order to set the team up for that Cup run success that’s just mere weeks away at this point of the season. In their last 10 games the Blues’ PP is averaging a 16% conversion rate, going 4-25 without a game that has seen them convert on over 50% of their chances through that time. To lighten their already hefty load through the extremely difficult Western Conference playoffs the Note will need to buckle down, and stop over-passing to ensure they are generating the proper chances and creating those great rebound plays to boost this piece of their game accordingly. If the team can keep their feet moving and continue to move the puck quickly through those seams they will catch the opposition off guard, and with all the skill they have while up a man, should be able to convert regularly moving forward (unlike the video above where they keep the puck on the strong side of the ice for an easy save from Hiller). When they manage to do that, fans can expect to see some ‘blow out’ games as teams will be unable to keep up with the firepower the Blues have from top to bottom, and from the front to the back end. This will not only translate to more offensive production from all players (forwards and defense alike), but will also ease Brian Elliott and Jake Allen’s loads, as they will not have to be perfect to ensure a victory each game. This only means great things for the Blues squad this year, especially when All-Star defenseman Kevin Shattenkirk is able to return (4 G, 20A on the PP this season). If the team can solve these power play woes before Shattenkirk’s return, his presence will likely place the Blues in a league all their own, and will cause the opposition to tremble each time they go down a man. This is exactly where you want your opposition’s mind coming into a game, a feeling the Blues are all too familiar with from their recent playoff follies against the Kings and Blackhawks. If the team can gain this form heading into April, they will be the ones with the mental advantage who will be striking fear into whomever they play before even touching the ice, and again when that team commits a penalty. This should translate to quite the spring for the club which is great news for this group with a chip on their shoulder and something to prove. Blackhawks are currently 2 points behind Nashville and 3 behind St. Louis with 12 games left. 2 of those 12 games are against the Blues. If the Blues can manage to stay level headed while putting their opposition through the mental and physical ringer, they truly will become the force many think they are primed to be this season. That means fans can finally leave the last 2 playoff series in the past, and will be able to enjoy a lengthy run towards Lord Stanley’s Cup into June. This group of guys is special, and have everything falling into place at the right time this year, now they need to get this final piece of the puzzle in place to shut up the nay-sayers, and to claim their place in the Blues’ and NHL history books.